Futurism, an Italian movement, made its debut with the publication of its manifesto, written by poet Filippo Marinetti, on the front page of le Figaro in 1909 and began to subside in 1918, just as World War I was starting. This art movement preceded that of Dada about which I wrote in this post. Futurism, in fact, influenced many other 20th century art movements including Art Deco, Vorticism, Constructivism and Surrealism. The futurists believed in the powers of technology which would usher the world into the future. They were concerned with movement and depicted their preoccupation in painting. 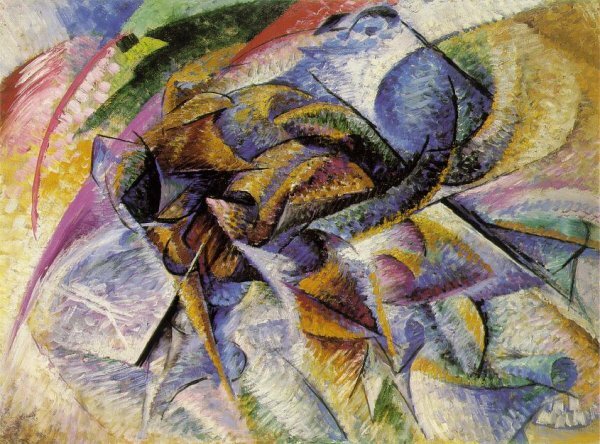 For example, using vibrant colors and flowing brushstrokes, the Futurist painters attempted to experiment with the photographic technique by breaking motion into small sequences and using a wide range of angles to capture the essence of time and motion within the painted image. 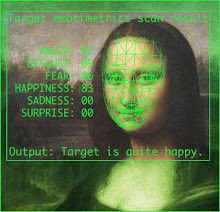 Futurists mixed activism and artistic research. They organized scandalous events that expressed their rage at antiquity. A primary goal of the movement was to eschew the old society and usher Italy into the age of modernity. Certain Futurists promoted themselves to try to join forces with the Fascists, who were just coming into power. But Mussolini showed a preference for the Novecentro Italiano movement of artists who identified with and promoted the classical order of Italian heritage and history. Futurism was not , of course, solely a movement of painters. 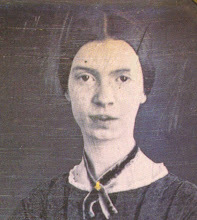 Like most art movements their ranks included sculptors, poets, writers and musicians. This post is primarily concerned with the painters and a bit with the sculptors who were a part of the Futurist movement. One of the leading painters of the Futurist movement is Gino Severini. For years I've been looking at certain of his paintings here and there but it's only recently that I took his name from my list of artists to explore further and ran smack into what's become a significant effort on my part to learn about and understand Futurism and put it into a historical context. 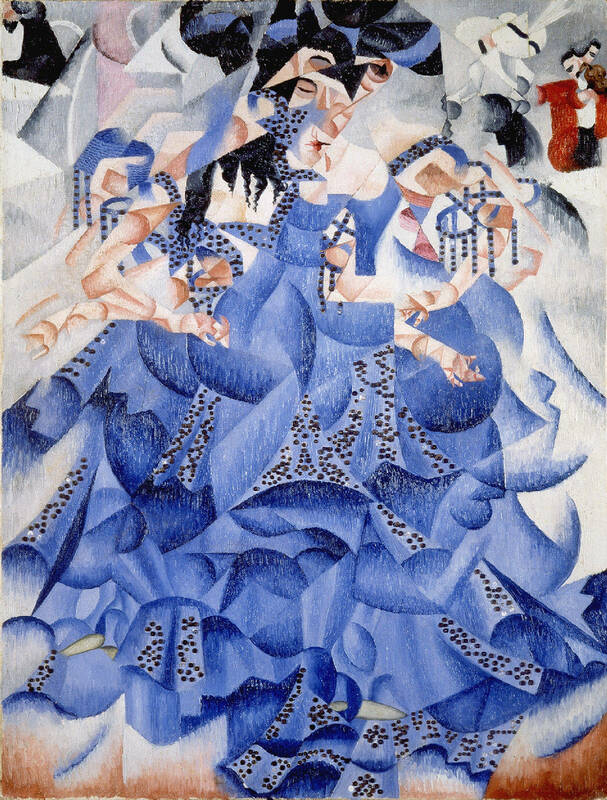 As a resident of Paris from 1906, Severini served as an intermediary between his Futurist colleagues in Italy and his friends among the Parisian avant-garde, dominated at this time by Cubism. 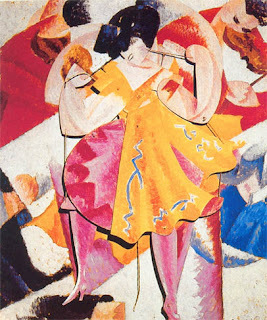 Severini was to return to Cubist themes in his later works. 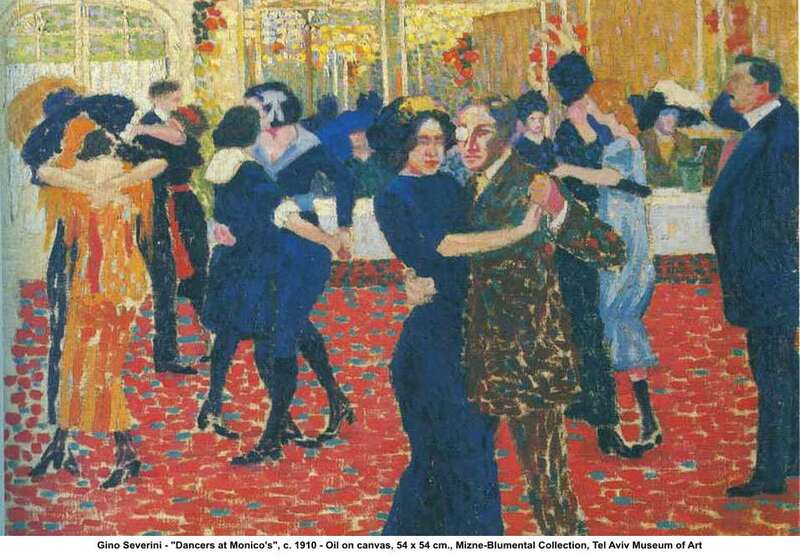 The theme of dance was among the stronger influences of Severini's artistic imagination. 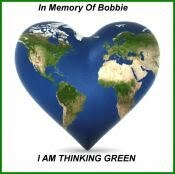 Dance was for him an icon of modernity. It served as a metaphor for the exploration of new forms of physical and psychological involvement of the spectator. 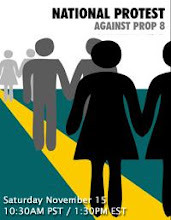 "One of the main causes of our artistic decline lies in the separation of art and science." 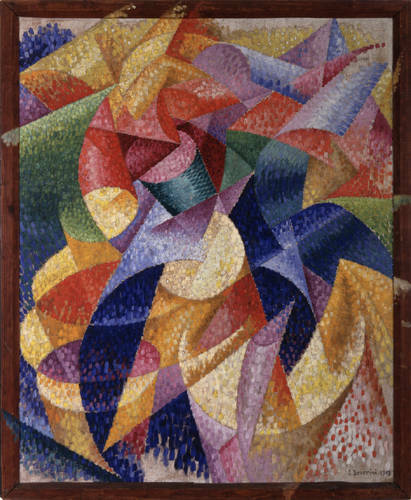 Severini later abandoned any recognizable human form in favor of depicting movement in dance exclusively through abstract forms and color. Let me move on to another of Futurism's most influential painters, Umberto Boccioni (1882-1916 ), who was the main theorist of the movement. 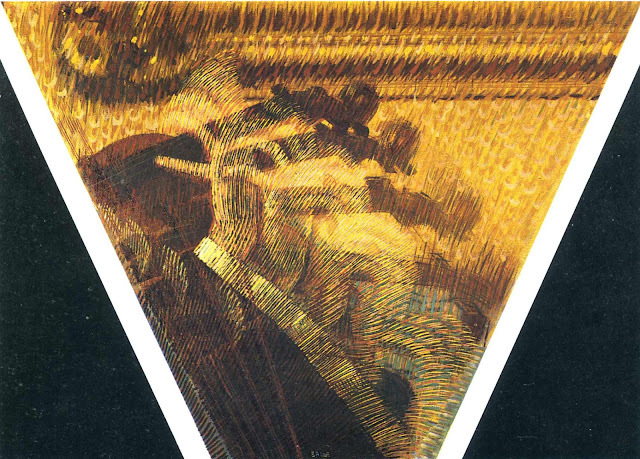 (The following three images are paintings and one sculpture by Umberto Boccioni). 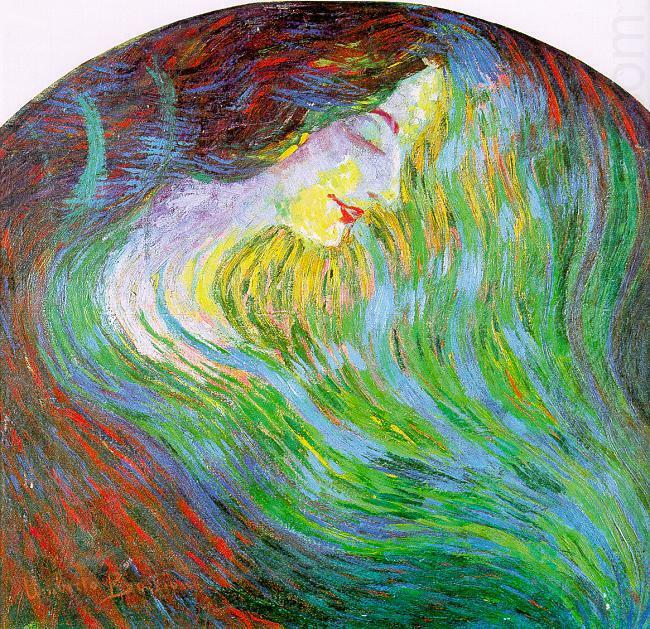 Giacomo Balla (1871-1958) spanned the first and second, post-war wave of Futurism. Both Severini and Boccioni were his students. 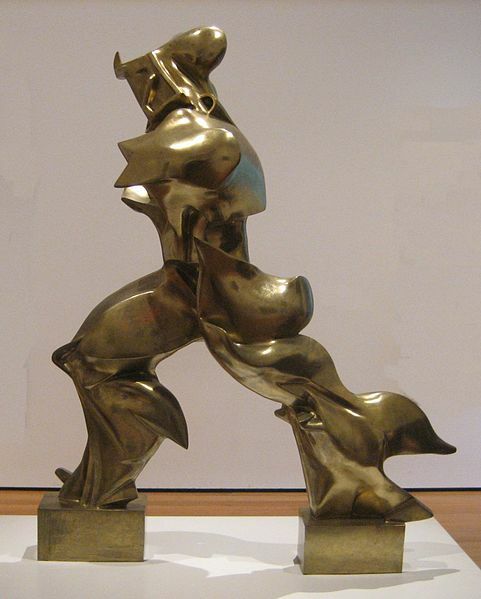 Balla's style changed remarkably with the adoption of Futurist dictates of light, movement and speed. Or perhaps his personal leanings as a painter coincided with the ideas of the Futurists. Balla's paintings addressed the themes of work and humanitarian concerns, reflecting is Socialist politics. 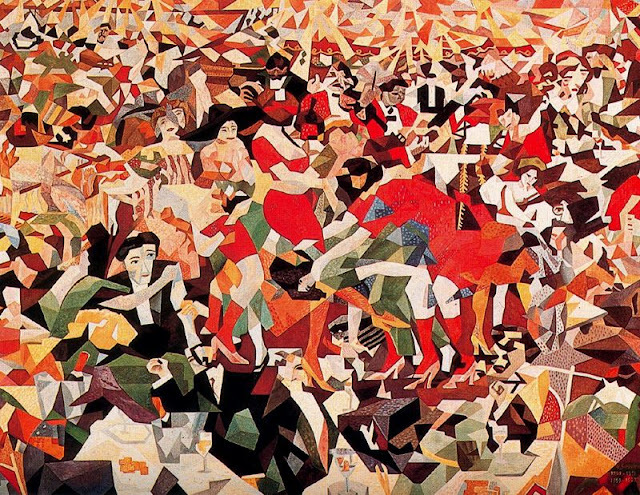 Throughout his participation in Futurism, Balla celebrated the machine and captured figures and objects in motion. Repeated sequence of movement were Bella's vehicle for depicting movement. 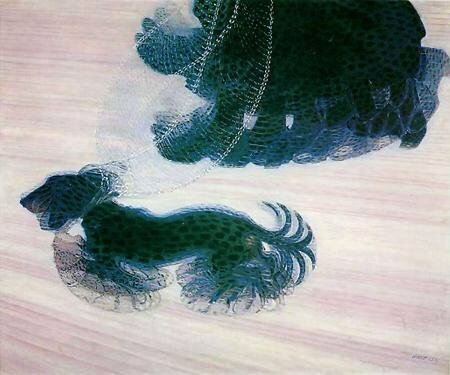 In the painting below, Dog With Leash, Balla recreates a sense of movement, speed and light via superimposed images. 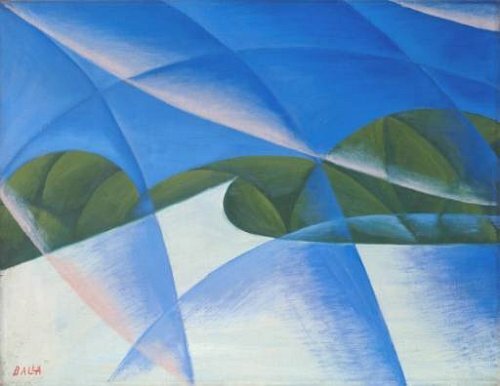 The Futurist movement included a handful of Russian artists, the best of which is the only woman in the entire group, including the Italians - Natalia Gonchorova. 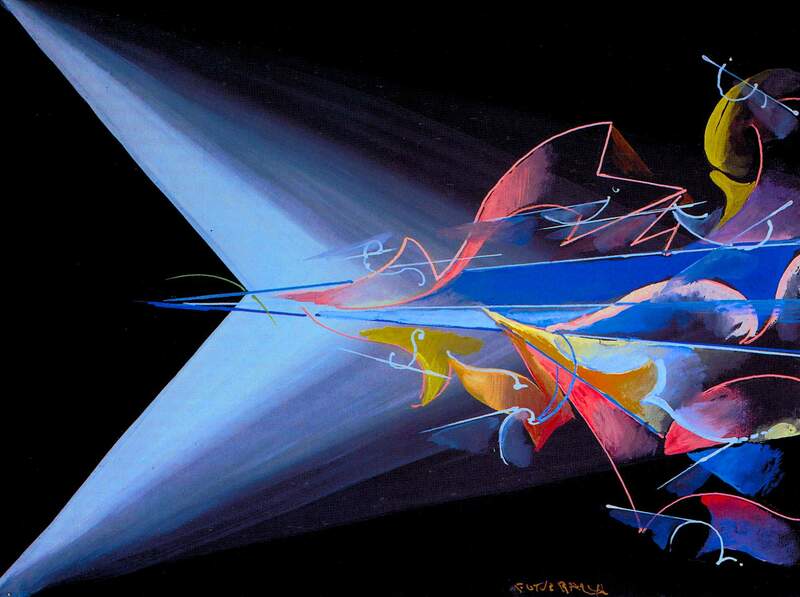 Futurism also influenced American artists such as Italian-born Joseph Stella. The Severini paintings you've chosen to show really are some of his most beautiful and go far to show how his vision evolved over time. I really like The Dance (in blue) as is practically incandesces on the screen. The Sea Dancer has a similar effect but with simpler yet organically interwoven forms. I'd say yes to either on my wall. 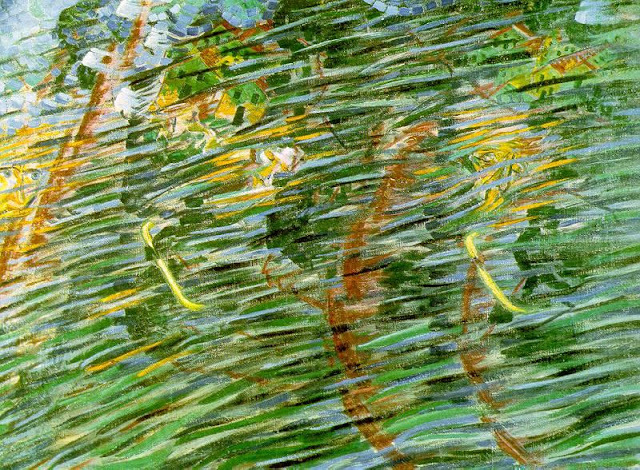 Boccioni's work was completely unfamiliar to me until now. They're all wonderful but the one I like the most of these is the first - The Street Enters the House. That's the kind of parade we should all witness at least once in our lives, don't you think? You've certainly picked the best one for last. I adore the movement and colors of Dog With Leash. Maybe it's because I'm so fond of dogs or perhaps because the first of the only two dogs I've ever shared parts of my life with was a lovely little dachshund who moved just this way. You've bestowed us with yet another wonderful collection of images and descriptions to enlighten us and brighten my evening. Thank you, my friend. I first fell for Severini's The Dance, which I'd come upon when I compiled the post on Dada and in researching Futurism, discovered also how much I like these other Futurists such as Balla and Boccioni. The Russian Futurists are also quite impressive and I'd one day like to focus on them in a future post. I really like the movement of the dog as well in the Balla painting and the Hands of a Violinist is probably among my favorites in this set. Since Futurism included musicians, I find the painting to fully exemplify the motion and speed that Futurism dedicated itself to depicting. Your posts open my mind to more than I could otherwise imagine. The passion for color, movement, and possibility are as clear as they are beautiful. Yes, good stuff to fill the mind with! I've long had a 'thing' for the Futurists... on the one hand I enjoy their zeal for all things new/fast/mechanical/violent... all the changes they were witness to. Their beautiful interpretations. On the other hand I also find them almost hysterically daffy... which of their fellows purchased a new car and raced it through the streets until he crashed it into a ditch? The wishful journeys of the 'aeropaintings'. 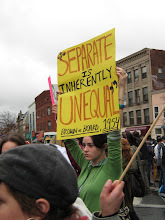 Their (unrequited?) bit of romance with fascism. Those crazy, over-the-top Italians! Gotta love 'em! Thanks for the comment. I'll have to check out the Estorick when I return to London one day (I hope). Thank you for this beautiful post! Im so enjoying looking at the paintings. BTW I think you must mean 1919 in the begining of your post as just at the end of WWI, not 1909. Hope you are staying dry! We just have wind and light rain so far up here in NH. Thanks for catching that error. I've fixed it. I'm not sure how I came up with that! Yes, same here but I understand that lower Manhattan is experiencing a lot of flooding. and don;t forget the amazing design too! 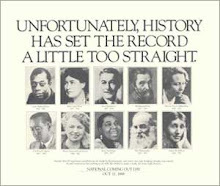 Amazing compilation here. Lots of eye candy, lots of deep thoughts! I'm glad I came back to look at this post! 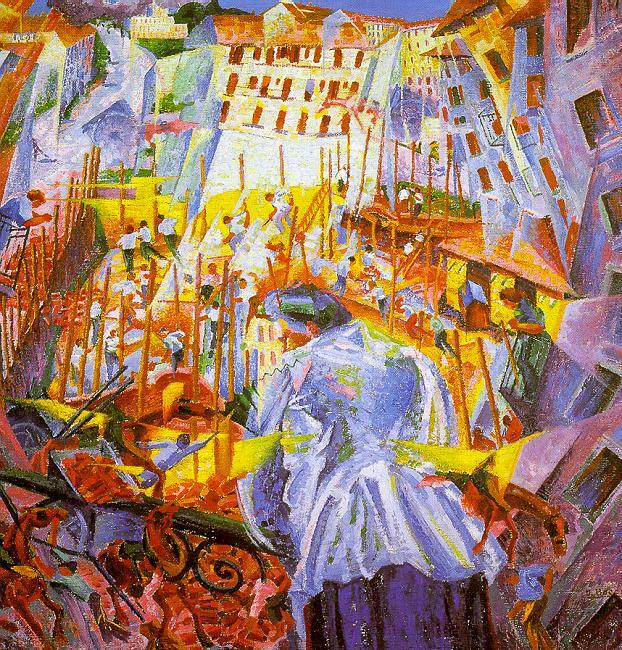 I love the Boccioni, in particular, especially "The Street Enters the House." Colors, light, forms, movement! One thing I relate to in most futurist paintings is the excitement and festive feeling. The paintings are often as full as a Hollywood show-stopping dance number, or a ticker tape parade. It's all happening too fast, and there is too much to take in. And yet that's part of the point, to reveal the frenetic in stop-action, so it CAN be observed and absorbed. I feel as if this, pushed further, carried to a logical extreme, would end up with Mondrian's "Broadway Boogie Woogie," which is both full of movement and energy, and mathematically stable.